Our main mission in the visual arts department is to teach and minister to students by helping them to discover and develop their talents and abilities. 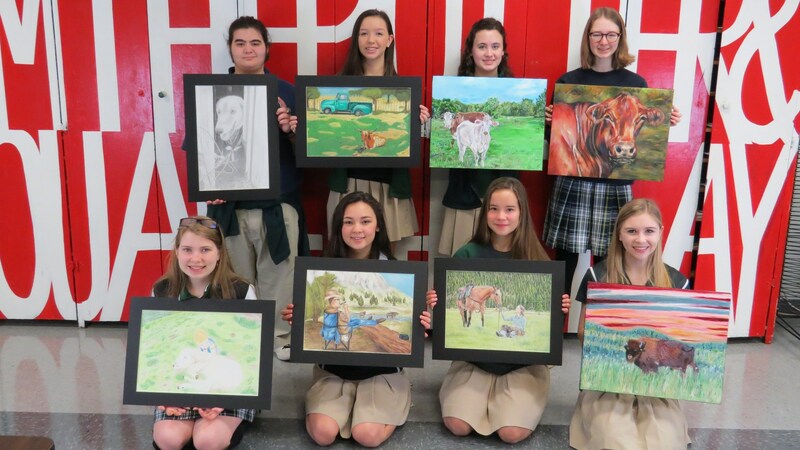 Starting in Middle School, the Lutheran South Academy visual arts program offers a unique experience for students to explore and expand their creativity. Middle school art is split up into 4 classes: General Art for 6th Grade, General Art for 7th and 8th Grade, Art with Enrichment for 6th Grade, and Art with Enrichment for 7th and 8th Grade. General art classes meet twice a week on Tuesdays and Thursdays. Art with Enrichment meets three times a week on Mondays, Wednesdays, and Fridays. On Enrichment Fridays, students learn about a new artist each month through activities and projects. Through this creative introduction, students begin to develop an understanding and appreciation for the arts. Our High School art program offers a wide range of different classes for students of all levels. High school art classes include Art 1, Art 2, Art Portfolio, Ceramics 1, and Ceramics 2. All art students are encouraged to start with Art 1, a yearlong introductory course that includes many 2-dimensional forms, as well as 3-dimensional forms. Art 2 is a higher level course with an emphasis on drawing and painting. Art Portfolio for advanced Juniors and Seniors, is a course where students work towards and complete their senior portfolio. Students work independently and at their own pace. Students are encouraged to express their creativity and personal journey through the art process. Above all, they are given the opportunity to glorify God through the artistic process.